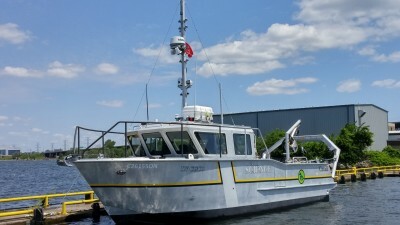 Built by Kanter Marine of St. Thomas, Ontario. Has a large open aft deck with a small crane, A frame, trawling winch and side davit. Vessel is powered by twin Volvo Penta 435's driving Hamilton Jet HJ322's and holds 1200 L of diesel, giving us about a 300 NM range. Microwave, small fridge, coffee maker and kettle. Head, but no bunks. Other: DST800 (Depth/Speed/Water Temperature), : Simrad NSS12 evo 2 MFD, FLIR thermo/night vision camera, WSO100 weather station, Autopilot, AIS class B, Wireless GOFREE system, Charts: Navionics Platinum plus, search light.